Hasn’t the time flown? Nearly forgot to do this as the end of the month seems to have come so quickly.Click on the pic above to go to Kathy’s blog where you can see all the other lovely pics as well. Most of these were taken on our recent trip to Lake Como in Italy. We went on a boat trip across the lake from where we were to a little town called Varenna. We were just wandering up the hill on a little path and came across this villa which is now a museum and this was the view from the terrace – wow! I hadn’t got the list for this month’s hunt before I went so used the computer in the hotel to check. 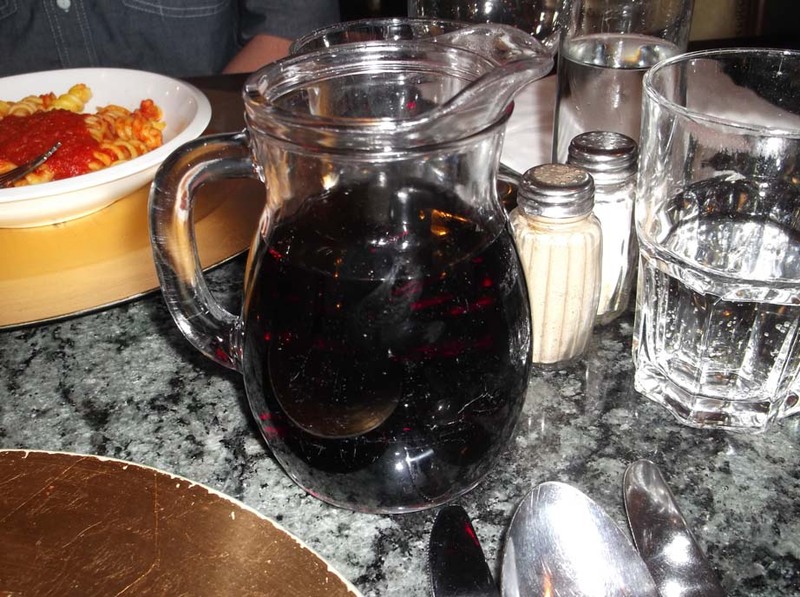 As soon as my Mum and the kids heard this category they said ‘red wine’ – so here is a pic of the wine we had every evening – even Jake got into drinking it. Though I think I could live without it …. but do love it! 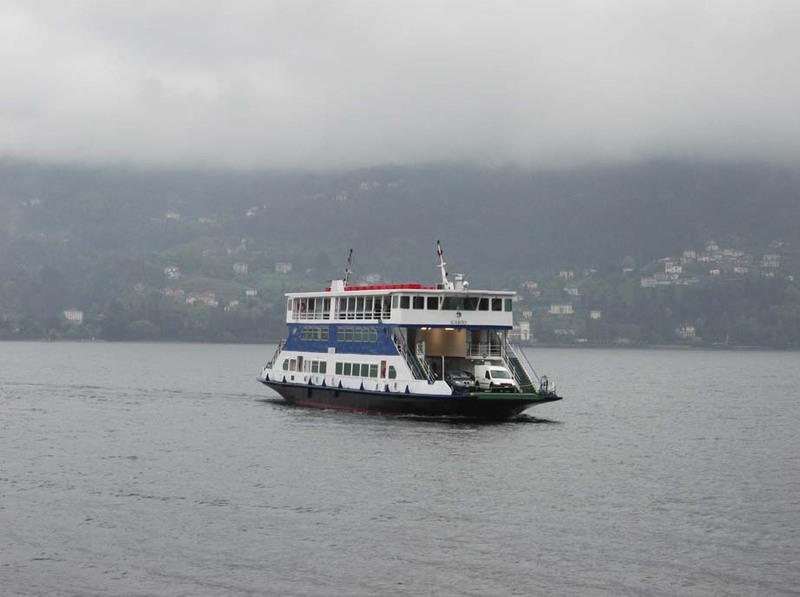 The ferry-boat going in the direction of Bellagio across the lake from our hotel on a very misty first morning. 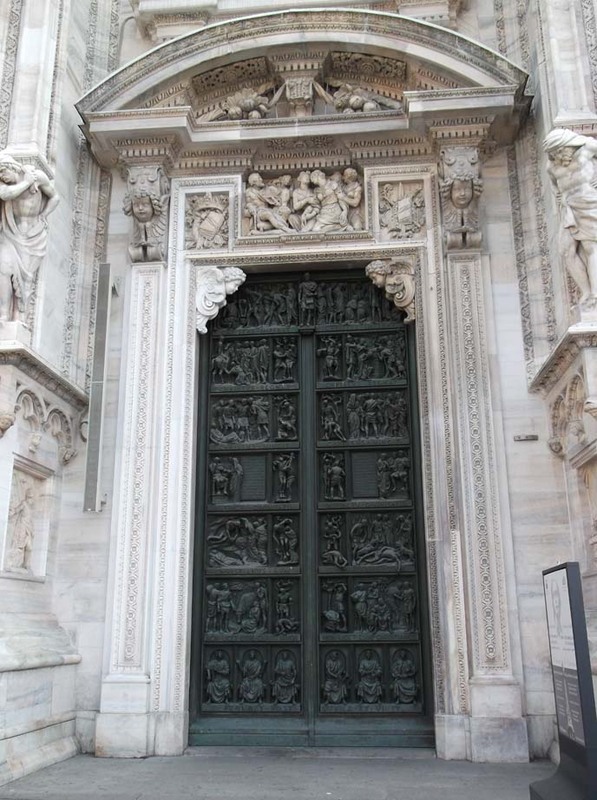 This had to be one of my (many) door pics – this one from the Duomo Cathedral in Milan – what a door! While in Milan we visited the Milanese version of Harrods and this was in the Food Hall , designer water . I don’t know if you can see the price tag but it says 59 euros – the phrase ‘more money than sense’ comes to mind! 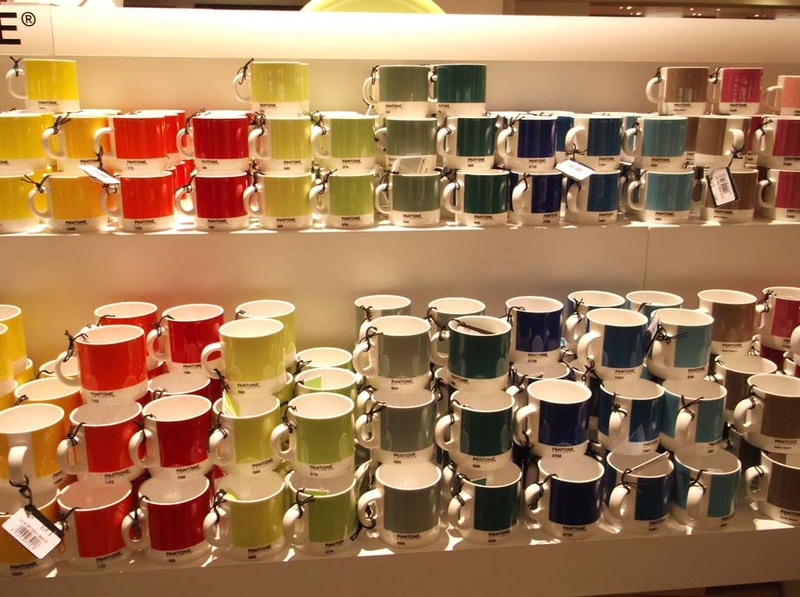 From the same store these lovely Pantone mugs – have just bought Jake a couple of the cheap version of these from our local store for his ‘bottom drawer’ for going to University in Sept.
Our amazing train journey over the Alps – the Bernina Express train. 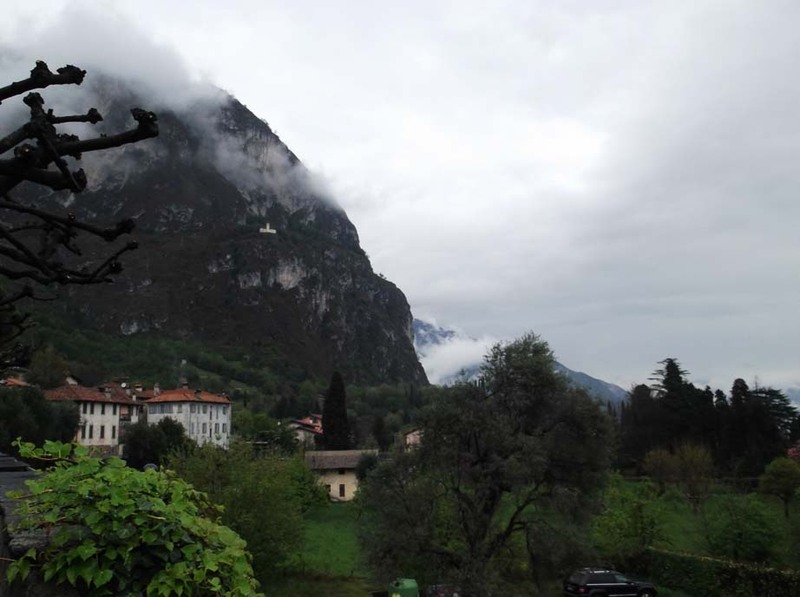 The first morning was very dull and misty but that meant there were amazing clouds clinging to the rocks in the village behind the hotel. Ellie has just bought me this book from my wish list as a pressie for help with her dissertation -she is such a lovely daughter and it did make me smile lots and lots! 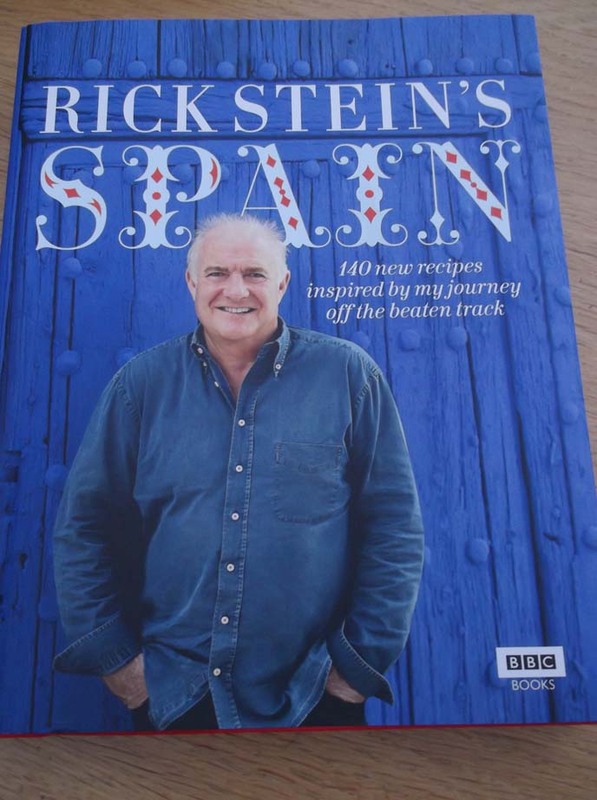 I love Rick Stein, the series was brilliant and he has a lovely smile as well! 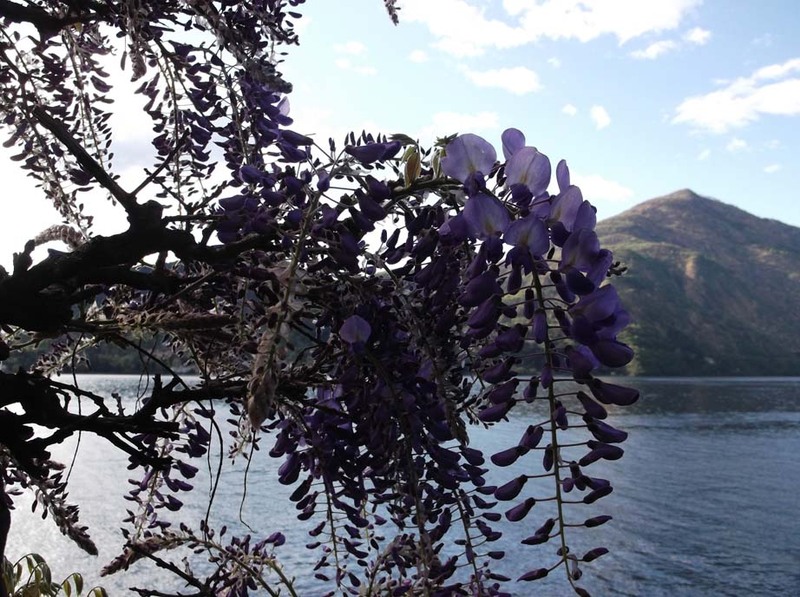 Beautiful wisteria in bloom all along Lake Como. They would be if you tried to wear them! 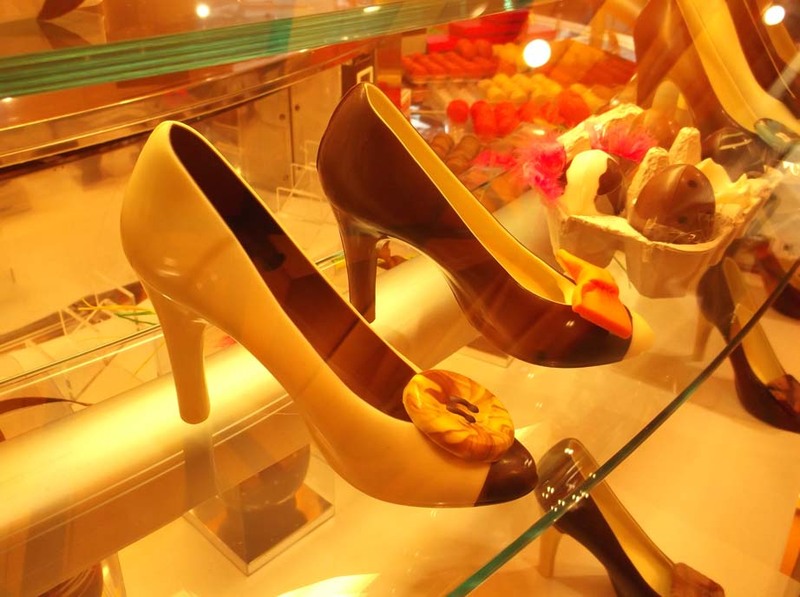 Miniature chocolate shoes from the Milan store food hall – yours for 35 euros. 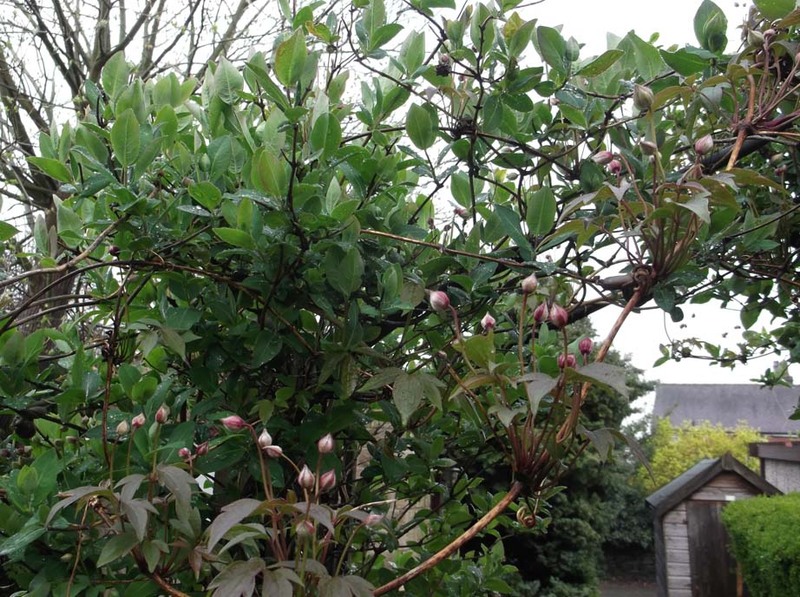 The clematis and honeysuckle over my garden arch – just waiting for it all to bloom now. Lovely photos – those chocolate shoes are amazing! You have some really beautiful pictures – makes me want to go off and travel! Great set of photos, I can’t choose which I like best! So many fantastic photos, Loved them all. 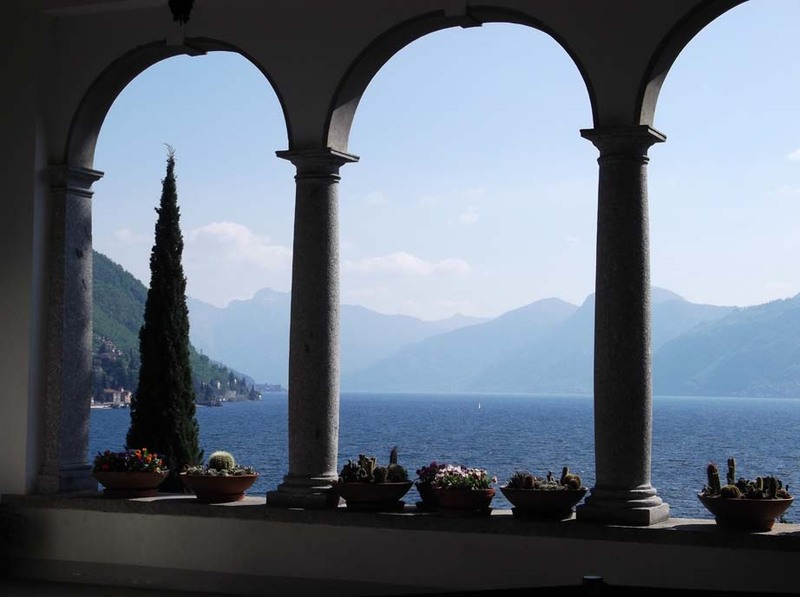 Holiday shots are fantastic – I’ve just put lake como on the list of places I want to see. The Bernina Express made me laugh – I have a Bernina sewing machine that is in need of a lot of TLC and isn’t very express at all! OH Alison, these are such wonderful shots! I firmly second the title of ‘amazing’! Wow!!! Where’s that train, I’d love to go on it!!! We went on ‘Le petit Train jaune’ in the Pyrenes and I loved it and knew that I just wanted to go on a similar train journey again! I’d like those mugs but bloomin heck there must also be some real mugs if they’d ACTUALLY pay that for water!!! I love your photos in this months hunt, especially as most of them are around Lake Como. We stayed in Cadenabbia and walked up to the church you can see in the distance on top of the mountain in your Rock picture, so brought back may happy memories. Thanks for all your comments – it really is a lovely area to visit, I would have loved to go up to the little church. 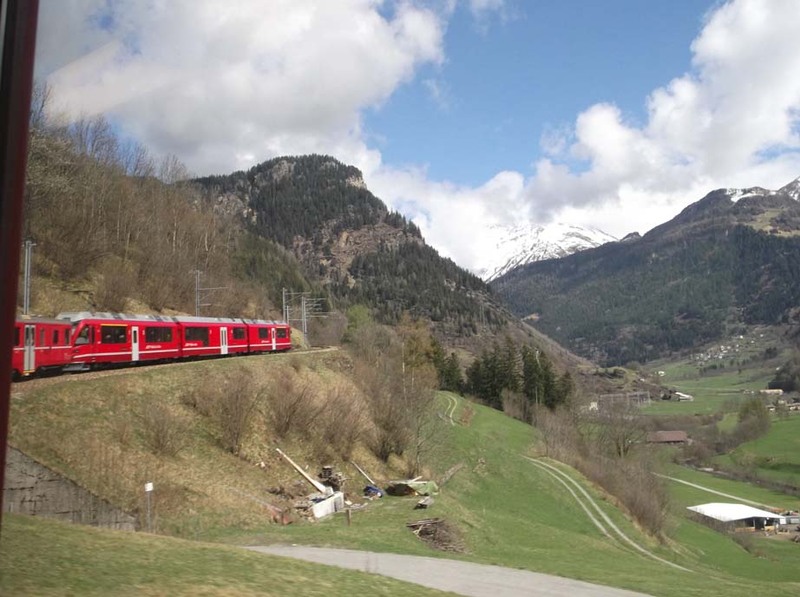 The train goes all the way to San Moritz and back over the Alps.I agree with Kezzie silly money for water! Miniature chocolate heels – how clever. I would never have guessed. I love your photos but especially the one of spring. Such a wonderful group of photos. Designer water?! I’ve never heard of anything so ridiculous! The chocolate shoe is very clever. what a great set of photos! I’ve enjoyed seeing bits of Italy here and you have soem great finds – like the shoe and the designer water! 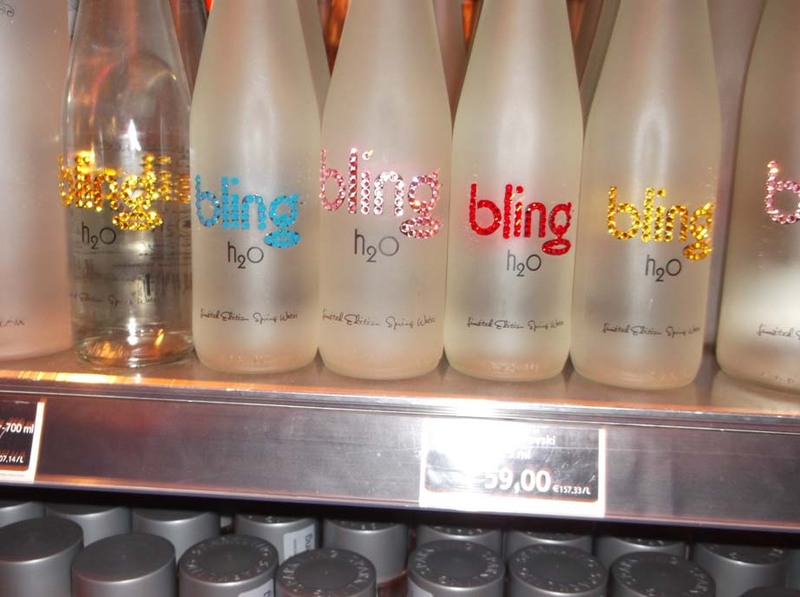 I didn’t know you get could designer water, I wonder who is actually daft enough to buy it! Lovely collection of photos. I loved the sticky shoes and that lovely carved door for In/out. What a beautiful door and the view in the 1st picture is truly amazing.